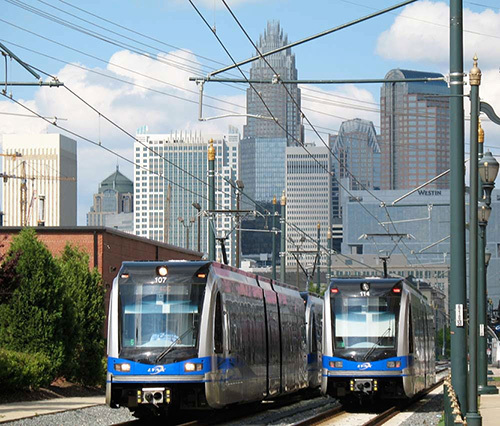 The LYNX Blue Line (Northeast Corridor) Extension is a 9.3-mile addition to the existing light rail line that will bring service to UNC Charlotte Center City Building and two stops on main campus. The impact will be significant, requiring infrastructure and service plans. Planning requires Information. That's why a survey has been created to ascertain the commuting habits and interest that students, faculty and staff have in using light rail and buses for travel to and from UNC Charlotte. Information gathered from this survey is crucial for decision making now. A large sampling of 8,000 students (selected to mirror campus demographics) along with faculty and staff, will soon receive an email with an exclusive link to the survey. When you receive the email with survey URL, it's important that you respond. There are 20 questions and should only take about five minutes to complete. Those who complete the survey will have their names entered into a drawing for an iPad. The UNC Charlotte Light Rail Ridership and Commuting Survey will launch Tuesday, November 10 and run for two weeks. 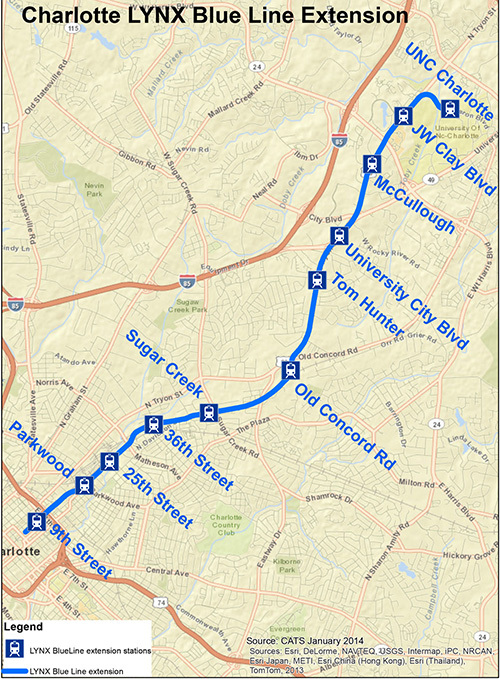 When completed in 2017, LYNX Blue Line will run from I-485 in South Charlotte through Uptown, stopping at the UNC Charlotte Center City Building, North Davidson and University areas, CRI Campus and terminating near North Deck. The Light Rail Coordinating Committee, a group with campus-wide representation, was first convened last summer by Beth Hardin, Vice Chancellor for Business Affairs and Betty Doster, special Assistant to the Chancellor for Constituent Relations. Here's some spirited 49er patterns to download and use for Halloween pumpkin carving or painting. Send us a picture of your finished product! Email to auxiliaryinfo@uncc.edu or via Twitter, @unccaux. Parking is a hot topic that's largely been blown out of proportion. In truth, Parking and Transportation Services is full of hard working people and without them parking on campus would be worse than the busiest Wal-Mart on Black Friday, or even Force Friday. Their job is necessary. They are not the Galactic Empire, minions of Sauron, or Justin Bieber. I have worked as an intern at Auxiliary Services for over a year now and in the process, have learned so much about parking at this university. Many of the perceptions I had as an undergraduate student changed completely after interactions with PaTS staff. These people, many of whom are students, go about a job that maintains order in parking areas. They often endure hateful reactions from those who don't understand that enforcement personnel are really looking out for the best interests and safety of everyone who parks at UNC Charlotte. Dear readers, I ask you to take a moment, step back and look at the whole parking situation with me. I may not lead you to a place of respect and understanding for the role of PaTS, but hopefully at least, your opinion will be more informed. Do you want to avoid getting parking citations? All you have to do is follow the rules and get a permit. Please. I beg of you. Be a good citizen of Niner Nation and park on campus legally. If you are unable to get a permit you can use visitor parking or get a temporary permit for as many days as you think you'll need for $6 per day (which is $4 cheaper than the Visitor parking day rate). You will have peace of mind and won't dread that walk back to your car wondering if you'll have a penalizing yellow envelope on the windshield. There's no denying that the price of a parking permit is high and you'd rather spend that chunk of money on absolutely anything else. On this there is unanimous agreement! But there's a reason permits cost what they do. Read why if you want to know and while you're at it, if you want know where that money goes, PaTS publishes those numbers every year. Here's last year's numbers. There are almost as many parking permits as there are flavors in a Baskin Robbins including some lesser-known money saving ones. Commuters and Faculty/Staff can save a little money by purchasing remote lot permits for Lot 6A (which has a shuttle stop right there) and Lot 27 (a walk-in lot). I purchased a Lot 27 permit last year and loved it. I saved $240 and found the lot is just a small distance from two bus stops. Only on campus twice a week? There’s a permit for that. Only have night classes? There’s a permit for that. There is even a web widget to help select the best permit for you! Graduating in December and you can't buy a Fall-only permit? No worries! Turn in your permit at the end of the semester and you'll get a prorated refund. One of the most common complaints I hear from peers and colleagues is that there are not enough parking spaces. While the count numbers prove that's not true, it's a belief rooted in everyday parking experience. Here's what I mean: when you go to a place that does not have a mass population coming and going at the same time, like for example the grocery store, the number of people there at the same time as you rarely seems extraordinary. You arrive and park in the closest spot available. Sometimes you get that primo space in front and sometimes you don't, but you almost always can see the door to where you're going from your parking spot. But it's not like that on campus. Thousands of people are looking for a place to park at highly concentrated times, 9 a.m., 11 a.m and 1 p.m., and, being human, they all want to park as closely as they can. Unfortunately the closest, most central lots and decks fill up quickly and stay that way until after the rush, around 2 p.m. or so. That’s just how it works when class schedule determines the ebb and flow of cars. But our expectation is based more on the grocery store parking experience. That's why I see people drive around the Union deck, circling over and over again like characters in a Scooby-Doo episode. They don't realize that there are other open spots elsewhere on campus. Anything beyond West Deck or East 3 seems far out; add to that the price you paid for a permit and having to park at the far reaches of campus becomes an indignity. Totally understandable! Many commuters and staff don’t even know where North Deck is (with its thousands of empty spots every day) or that it has a shuttle stop right at the entrance! Parking at CRI Deck when you have zero classes on that end of campus seems completely counter-intuitive! But it’s not! If you come in to campus at peak class times, it's best to park in lesser used areas like these. They all have shuttle service and in the end, can save you lots of time. Let’s say your car breaks down and you need to use one belonging to someone else, like a parent or friend or a rental. A common misconception is that you can just hang your tag on the other car and be good to go. But if you do, you’ll get a citation and that’s not fun for anyone. PATS needs to keep track of what cars are registered to what permits to make sure they are being used correctly. If they didn't, the black market for stolen permits would thrive! So here's what you do in that situation: go to the PATS office with the loaner vehicle's registration and they'll tell you want your options are (solutions vary based on who the car belongs to, if it's a rental and how long you'll be driving it). If you didn't bring your permit and need a temporary permit for the days you're driving the loaner, PaTS will fix you up with that, too. As a permit holder, you won't be charged for the temp permit (up to 10 days worth depending on permit type). To all those for whom this is your first year parking on campus, don't stress; everything is going to be ok. After the first month of class, parking patterns shake out as people become familiar with schedules and parking area alternatives. To those who make parking into a mythical beast that cannot be quenched, I ask that you please just abide by the rules and don’t take it out on people in orange. They are looking out for all of us. Just remember that parking illegally without a permit is really stealing a space from someone who has bought a permit. And one more thing: if you need to load/unload near a building, be mindful of tow-away zones. Always call PaTS first. They will advise you where you may safely load or unload and give permission to do so for 15 minutes. Or you could use your Delorean and travel back and forth through time again and again creating multiple versions of yourself to help get the job done. However, this would cause a rip in space and time resulting in the destruction of all human existence. So better yet, call 704-687-0161 and inform PATS. That way you won’t be cited and then you’ll be happy, clapping along like a room without a roof. ...thanks for doing so! I hope this blog contribution has helped your understanding of why parking is so different here and that the people whose job it is to maintain parking order are not the enemy. They really want to make sure that everything runs as smoothly as it can on a pedestrian-centered campus with an overwhelming majority of commuting students. Let's be excellent to each other and PARK ON, DUDES! A lot more commuters are using the tip to park in Lot 6 and take shuttle, finding it's easier than circling full decks. Even at peak class times, there are many open spaces there and in other lower-demand areas. Editor's note: As marketing intern for Business and Auxiliary Services, Patrick Wisniewski has produced videos for parking, meal plans, College Colors Day and the opening of South Village Crossing. He also presented Meal Plans and Parking information to all incoming students at SOAR throughout the summer. When he completes his master's program and leaves us for bigger and better things later this year, you may for a time see the Auxiliary Services building draped in black. Across the United States on the first Friday of each college school year, students, parents, family, fans and alumni observe celebrate National College Colors Day. This day is annually celebrated at UNC Charlotte by wearing green and white and/or UNC Charlotte/Charlotte 49ers apparel. To support the student-led initiative of #weargreenwednesday, and because Niner Nation typically likes to do things in a big way, campus will be celebrating College Colors day for three days! Friday will be a fun group viewing of the Charlotte vs. Georgia State game in the Student Union theater. Seating is limited; show up early! 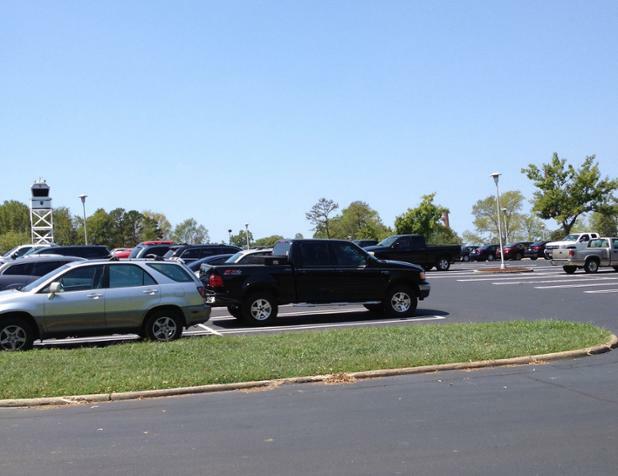 UNC Charlotte Parking Permits are required and will be enforced on the first day of class. If you have not already done so, purchasing online is the easiest way to get your permit. We’ll have it waiting for you in an express pick-up line. If you do not have a permit, you must pay to park in a visitor parking area, e.g., Union, Cone, East 1, South Village, or CRI decks or Lot 4 pay-by-space. Visitor parking map. You may also buy a temporary permit for $6/day for as many days as you think you’ll need. Temporary permits must be purchased in person from Parking and Transportation Services. Temporary permits are not valid in Visitor parking areas and do not work in gated decks or lots. Peak parking demand will occur Monday – Thursday, 9:00 a.m. – 2:00 p.m. (based on class schedule). The Parking and Transportation Services Call Center is open from 5:00 a.m. on Monday continuously through 10:00 p.m. Friday evening each week to answer any parking or transportation related questions or concerns: 704-687-0161. For short-term loading/unloading parking, call 704-687-0161 for permission and direction. Parking gates in all gated lots and decks will remain down from 5:00 a.m. Monday continuously through 10:00 p.m. on Friday evening, except during holidays when the University is closed. Single and multi-space meters are enforced 24 hours per day, seven days per week, except during holidays when the University is closed. Thursday August 20, 8:00 a.m. – 6:00 p.m.
Friday August 21, 8:00 a.m. – 5:00 p.m.
Saturday August 22, 10:00 a.m. – 4:00 p.m.
Sunday August 23, 10:00 a.m. – 4:00 p.m.
Monday August 24, 8:00 a.m. – 6:00 p.m.
Tuesday August 25, 8:00 a.m. – 6:00 p.m.
Wednesday August 26, 8:00 a.m. – 6:00 p.m.
Thursday August 27, 8:00 a.m. – 6:00 p.m.
Faculty/Staff permit purchase/pick-up is at the PaTS Office, #23 on campus map. A limited amount of discount remote parking is still available to Commuters and Faculty/Staff for Lot 6A (corner of Cameron Blvd. and John Kirk Rd., served by the campus shuttle) -UPDATE 8/21/15: SOLD OUT. Permit hangtags have a Radio Frequency ID (RFID) chip that will open gated areas appropriate for your permit type. You may add additional vehicles to a permit at no charge but the vehicles must be registered in the name of permit holder, their spouse, or a parent/guardian. Permits are to be displayed from the rear view mirror or on the driver’s side dash in a PaTS-approved clear pouch. The entire permit must be visible. Dash pouches are available from the PaTS office at no charge. The first two weeks of Fall semester is when parking demand is exceptionally high, particularly at Union Deck. Plan for it by either arriving before 8:00 a.m., or parking in a lot toward the margins and taking the Shuttle into center campus. Parking is expected to be especially tight on Monday, August 24 because of New Student Convocation, and on Tuesday, August 25, the first full day of classes. Decks and lots closest to the center of campus fill quickly and early. Union Deck, East Deck 2, West Deck, and the lots closest to those decks are often at peak capacity by 8:45 a.m.
MSU Lot (in front of Sanford and Moore Halls) has been removed. Lot 12 (NE corner of Mary Alexander and Craver) will be offline for several weeks. The Craver Road-facing entrance and exit of Lot 16 (by residence halls Oak, Elm, Maple and Pine) will close permanently Sunday, August 23. Access to that lot will be via Poplar Terrace. Be prepared. Have a plan in mind for alternative parking if your first preference is full when you arrive. Parking map. Don’t circle a full lot or deck! That only adds to traffic snarls that can occur near deck and lot entrances. Move on to a lower-demand area like North Deck, CRI Deck or Lot 6 (on Cameron near Campus Edge apartments). Maps and more about high versus low use areas. There are shuttle stops nearby for transportation to the center of campus if you don’t wish to walk. 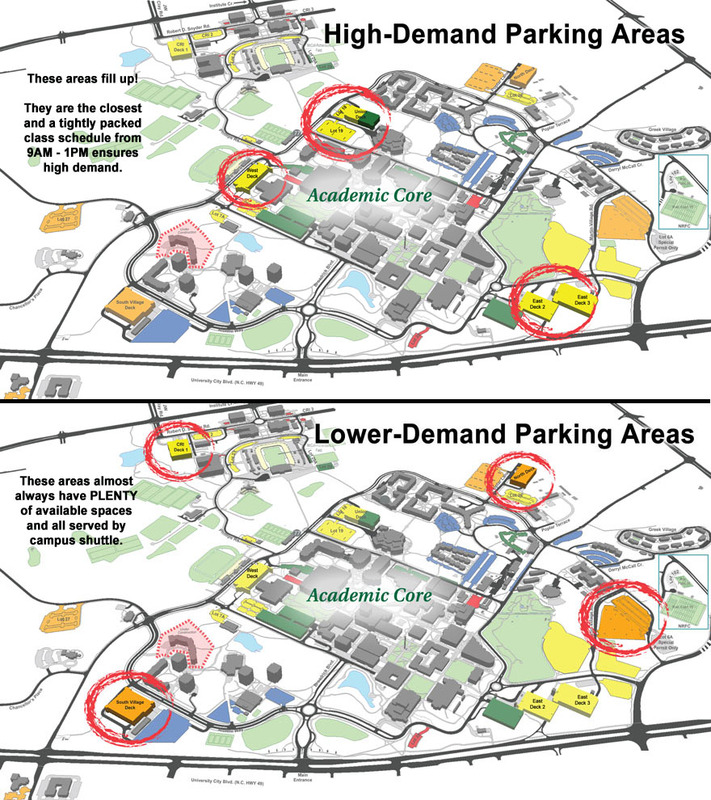 By the third week of classes, parking demand eases. Peak traffic times are 7:45 a.m. – 9:15 a.m. and 5:00 p.m. ­– 6:00 p.m.
Expect more traffic delays than usual due to campus infrastructure improvement projects. All shuttles from off-campus housing complexes must load and unload passengers at the bus loop of East Deck 2 only, entering at the Main Entrance and exiting via Van Landingham Rd. This measure is necessary because of infrastructure construction and to ease traffic on interior roads, but it may result in heavier congestion around East Deck 2, especially during peak class times. Students utilizing private shuttle services are advised to leave early. If leaving campus between 5:00 and 6:00 p.m., avoid exiting to John Kirk Drive by way of Van Landingham Rd. near Fretwell. Try using Mary Alexander Rd. to Mallard Creek Church Rd. or the bottom level of East Deck 2 that exits to Rt. 49 South (University City Blvd). If arriving on campus between 5:00 and 6:00 p.m., avoid the John Kirk Dr. entrance at Van Landingham Rd. (near the Circle K). Instead, enter campus by using Cameron Blvd., the Front Entrance, Mary Alexander Rd., or the bottom level of East Deck 2 from 49 South (University City Blvd). Pedestrians have the right of way on all crosswalks unless there is a traffic signal, which takes precedence. The traffic circle at Mary Alexander and Van Landingham Roads is controlled by a traffic signal, which must be obeyed by both pedestrian and vehicular traffic. Follow @unccparking on Twitter. PaTS uses Twitter to provide updates about of detours, delays and other relevant information. For those who don’t use Twitter, the same information is fed directly to the parking website home page. Commuter and Resident permits will not be valid in any parking decks or lots designated for football parking on Football Game Days. Student Resident lots (blue color coded), with the exception of Lot 25, are not affected by football. All vehicles parked in Lot 25 (across from Wallis Hall) must be moved by 12:00 a.m., the Friday before a Saturday home game. Vehicles not moved will be towed at the owner’s expense. Alternative parking will be at North Deck or any other R-designated lot or deck that has not been designated for Football parking. The Friday night game, scheduled for October 2, will require vacating lots and decks designated for football by 12:30 PM. More football home game parking information. Full service begins Monday, August 24. Campus Shuttle stop lists and route maps. This service is fare-free to all UNC Charlotte students, faculty/staff and visitors. Real-time campus shuttle and SafeRide Evening Safety transportation tracking and arrival information is available via smartphone or website with the UNCC NextRide app (FREE at Android and iOS app stores) or website/mobile site . Parking for the disabled is available on campus ONLY to individuals who have a DMV-issued disability placard and a valid UNC Charlotte Parking Permit registered to them. SafeRide provides disability transport throughout the inner core of campus for those with ongoing mobility impairments who have registered for the service, Monday – Friday, 7:30 a.m. – 5:30 p.m. Services require registration through the Office of Disability Services and completion of a Disability Medical Verification Request form. SafeRide is also available to those who need assistance on a temporary basis (such as recent surgery, lower limb injuries, visual impairments, or chronic diseases that impact stamina). This is also arranged through the Office of Disability Services, Fretwell 230 (704-687-4355). After completion of the required form, Disability Services will verify and send email confirmation of eligibility (usually processed within 24 hours or less). SafeRide Evening Safety Transport makes getting around campus safer, faster, and easier after dark. Service runs seven days a week, 6:00 p.m. – 2:00 a.m., picking up those waiting at marked stops on a continuous looping route. Vehicles keep moving and do not arrive or depart at set times. A list of designated stops and stop map are here. SafeRide van tracking and arrival information is available via smartphone or website with the UNCC NextRide app or website/mobile site . A comprehensive guide to “Everything You Need to Know About Parking and Transportation” is available as a printer-friendly PDF. For specific inquiries and concerns, the Parking and Transportation Services website has a contact form or you may email pats@uncc.edu directly. Or call the PaTS call center, 704-687-0161, open weekdays from 5:00 a.m. Monday continuously through 10:00 p.m. Friday. This is the face of someone unprepared to park! Parking on a large campus with a high percentage of commuters, where classes are densely scheduled Monday - Thursday mornings, is not like parking at the mall, where you can expect to park within eyesight of an entrance. It's more like parking at the airport. Early birds get spaces in the closest decks and lots and those who arrive later should expect to park farther away. Here are the changes you can expect, by location. Soon, the delightful aromas from Chinese dishes like orange chicken, broccoli beef and honey walnut shrimp will fill Main Street Market. Soups will also be served daily. Fresh sushi will be made at the adjoining Asian Eatery counter. Opening for Panda Express and Asian Eatery expected after Labor Day. Subway will reopen Monday, August 24; hours will be 7:30 AM – 6:00 PM Monday – Thursday, 7:30 AM – 2:00 PM Friday. Subway will add soups to the menu this year. Use Your Noodle, Sushi with Gusto, Au Bon Pain Soups and Bojangles’ Express. 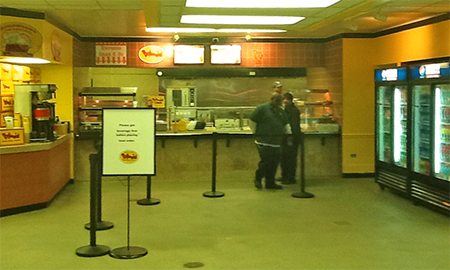 Bojangles’ has moved to the Student Union and Au Bon Pain soups will remain available at Atkins Café. Expansion to the Student Union brings Bo’s full menu to UNC Charlotte, including bone-in chicken and all the favorite sides and of course, that legendary iced tea. Hours will be 7:30 AM – 7:00 PM, Monday through Friday, 9:00 AM – 4:00 PM Saturday and Sunday. Mamma Leone’s; but Mamma’s in Prospector will remain. Crown Commons will have a “reset” period on weekends, closing after brunch at 2:00 PM, reopening for dinner at 5:00 PM. Dining Services first introduced made-to-order breakfast sandwiches on artisanal bread at Feisty’s this summer and they’ve been well very received. Read about it. Continental breakfast bar (at Prospector upper level salad bar). Expansion of returnable container program at SoVi2Go. For just $8, you can become a member of the SoVi2Go program. You’ll get two reusable containers (one small round and one large compartmentalized square) to use when you visit SoVi2Go. You can also just buy one container of whichever size you choose for $5. How it works: Just swipe your card and fill a container with your take-out meal. The next time you visit SoVi2Go, bring the back the used container in exchange for a clean on for your next take-out meal. SoVi2Go is open Monday-Friday, 10:00 AM until 9:00 PM. Reusable container program is only available for use at SoVi2Go. The Den’s hours will be Monday – Sunday, 3:00 PM - 1:00 AM this year. The one hour earlier closing time aligns service times better with SafeRide evening transportation. On Applying for a Passport at Union Station – FOR THE WIN! A recent blog post on Medium.com titled, “On How the US Passport Office’s Failures Will Help Your Business” caught our attention. The article was written by Peter Shankman, PR entrepreneur, best-selling author and marketing pundit. The upshot: what he experienced while getting a passport for his two year-old child is enough to cure anyone of wanderlust. Things may have turned out better for Mr. Shankman if he had applied for his daughter's Passport at Union Station in the Student Union. Union Station is an official U.S. Passport Acceptance Facility with a mission to make the process of getting government travel documents as painless as possible. The primary reasons why Passport applications are delayed or returned is because applications are incomplete, illegible, do not adhere to submission guidelines, or the wrong fee was paid. Having an application properly prepared and carefully submitted can greatly reduce odds of it being returned or delayed. Besides the superior attention paid to U.S. Passport applications, Union Station’s location in the Student Union is more pleasant than the average busy Post Office. Walk-in customers may take a number and a comfy seat in the Student Union rotunda if there’s a wait. And there’s a Starbucks Coffee right there, too. Felicia adds that the payment method is a bit different at Union Station. The application fee must be paid by check or money order and execution photo fees are paid in cash only. Final granting and issuance of U.S. Passports rests with the U.S. Department of State. Once an application is in their hands, the time it takes to approve and print is subject to requester volume. During peak travel seasons, the wait from start-of-paperwork until that little gold-embossed blue book arrives can be four to six weeks. So be sure to plan ahead and let Felicia or Angelia make the application part of the process easy on you. 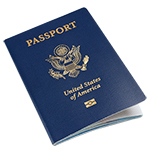 Passport processing is best done by appointment; call 704-687-5893 to reserve a time. Walk-ins are accepted Monday-Thursday, 9:00 AM – 11:00 AM. Passport photo service is also available. More about the many services offered at Union Station: unionstation.uncc.edu. The average amount a typical student at a four-year public university spends on textbooks is about $47 less than it was four years ago, $655 as opposed to $702. The National Association of College Stores (NACS) credits the decline to used book and book rental programs1. Barnes & Noble at UNC Charlotte has had both for years. In fact, our campus bookstore was among the first in the UNC system to offer a textbook rental program. Publishers set textbook prices. This limits what university bookstores can do to impact textbook affordability for students. But there are actions we can take together to help control costs. Inform the bookstore about adoption decisions on or before adoption deadlines2, to allow enough time to plan for rental rents (as books adopted for the following term will be shelved as used books to save students up to 80% of the original price), buy-back (as books adopted for the following term are bought back at 50% of the original price), and to source used books in order to increase the likelihood of offering more used books (at a 25% discount) to students. Consider costs of books and packages before making an adoption decision. Be aware that you may be able to negotiate prices with publishers. Ask the publisher how much the bookstore will be charged, and then make sure that price is honored. Consider adopting stand-alone texts instead of “bundles” so students can rent up to an 80% savings or sell back at 50% and buy used at a savings of 25%. When adopting a “value format” from a publisher (e-book, loose-leaf version, etc. ), consider the impact on students not being able to rent (saving them up to 80%), or sell back a book at 50%, and not being able to buy used books (saving 25%). The bookstore can help you run the numbers to determine which version is most cost-effective for students. Inform students on the first day of class about their textbooks; or better yet, send an email prior to start of class. Let them know when a book is “required” vs. “recommended” and tell them how the book will be used. Will it be used in class, for homework or testing only? This helps students understand the value of their investment, and reduces the dissatisfaction many of them feel when they purchase an expensive book but do not use it in class. If enrollments are large enough to make it cost-effective, consider a “customized” version of a text that may eliminate chapters not covered and may reduce costs. Avoid “bundles” that contain items such as access codes, readers, etc., that you do not plan to use in class. While often billed as “free,” these items may add costs and may add to student frustration over being required to purchase items that they do not use, or being prohibited from choosing a used book. Your campus store offers a comprehensive textbook program that includes a variety of formats and processes aimed at affordability. We leverage relationships with more than 7,000 publishers to help faculty select from an extensive catalog of affordable textbooks and reference books – including rental, digital, and used formats – to help students save up to 60% on textbooks and achieve success in the classroom. Textbook Rental Program: With more than 80 percent of titles typically available to rent, our students will have access to the industry’s leading textbook rental program. Our rental marketplace pricing and buyout programs offer a great opportunity for students to save money without compromising their educational experience. Students can purchase textbook rentals in-store or online; highlight text and make notes on pages; keep books until finals are over; and return books at the bookstore or through the mail. Digital Textbook Program: We offer a robust, academically relevant digital library. Digital offerings are designed with convenience in mind, allowing students to purchase and access books immediately. And, to optimize the digital textbook experience, we offer an exciting new digital reading experience, YUZU. Used Textbooks and Cash for Books: We obtain a large percentage of used book inventory for our students through our multi-channel buyback option known as Cash for Books. At the end of each semester, Cash for Books allows students to return their unwanted textbooks back to the bookstore for up to 50% cash back off the new textbook price. We closely review our school’s course information to identify those materials that may be used again..
Unbundled Textbooks and Custom Texts: We also offer several alternative textbook options that can help our students save even more money, such as bundled, unbundled and custom texts. While some bundled textbook packages include print and technology options that enhance the student’s learning experience like DVDs, study guides, online access and workbooks, others include additional course materials that may not be used in the classroom. When possible, we carry both bundled packages and the individual components, so that students can choose the option that works best for them. 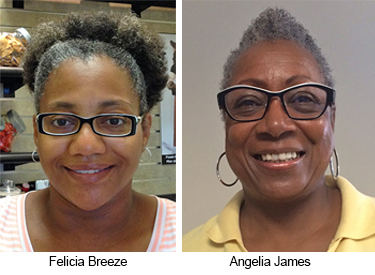 Many faculty members choose to create custom texts using select content and other materials. Custom texts address course-specific needs and objectives, allowing students more flexibility in their course material options. Lower Margin on New Textbooks: Back in 2009, Barnes & Noble at UNC Charlotte agreed to lower their margin from 23% to 18%. This is the lowest in the state and among the lowest in the country. Price Match Guarantee: Barnes & Noble at UNC Charlotte offers a 100% price-match guarantee vs. local competitors. Be informed and know what you’re getting. When price shopping, make sure you’re comparing “apples to apples.” For example, is the used book you’re about to buy online the correct edition? Did your professor order a book with a bundled code? Have more questions? Just ask! Send questions via this contact form, and we’we will make sure it gets to the person who can best answer. Thanks to Cheri Griffith, manager of Barnes & Noble at UNC Charlotte and Greg McCambridge, Auxiliary Services Licensing and Bookstore contract manager, for providing content for this article. The rest was generated from F/S premium gated access fees, and visitor parking fees, etc. ($1,830,734 came from visitor/short-term parking, including conferences, meters, visitor deck pay stations and visitor parking vouchers). $1,148,545 went to utilities, lease for Center City building parking, gate equipment, permit printing, credit card fees, insurance, maintenance contracts, etc. Again, most of the money from permit sales and visitor parking charges was used to pay back construction bonds on existing decks and maintenance/upkeep of all campus lots and decks (replace lights, repair surfaces, repaint stripes, etc.). Income was up over last year which correlates to an increase in visitor parking. Operating expenses went down. This is why permit prices did not increase, remaining the same for a third year in a row. Any money left that exceeds current obligations will go toward design and construction of future decks. Permit prices are set to support a 10-year business plan that ensures that new decks can be built as enrollment growth demands, that parking removed by new buildings can be replaced, and that existing parking facilities are maintained so as to extend service life. That means that parking has to be self-supporting, paid for by those who use it, students, faculty/staff and visitors. PaTS will continue to publish the numbers every year so that you can know where the money goes. (Here’s the numbers from academic years 2013-2014 and 2012-2013). We’re also happy to answer your questions about parking. The Parking and Transportation Services call center is open from 5:00 AM Mondays continuously until 10:00 PM Friday; call 704-687-0161. Or you can Tweet @unccparking or write pats@uncc.edu. *PaTS and the University reap no financial benefit from citation fines. Citation proceeds are governed by a State statute (GS 115C-457.1-3 – p. 305) which says that civil fines (i.e., parking tickets), minus the cost of collection, have to be remitted to the State of North Carolina, which then allocates the money to local K-12 public schools. The cost of collection cannot exceed 20% regardless of how much is actually spent to provide enforcement and collect the fines. Unfortunately, it costs PaTS more than the 20% they're allowed to keep to cover the cost of enforcement. Citation proceeds for 2014-15 was $117,424. 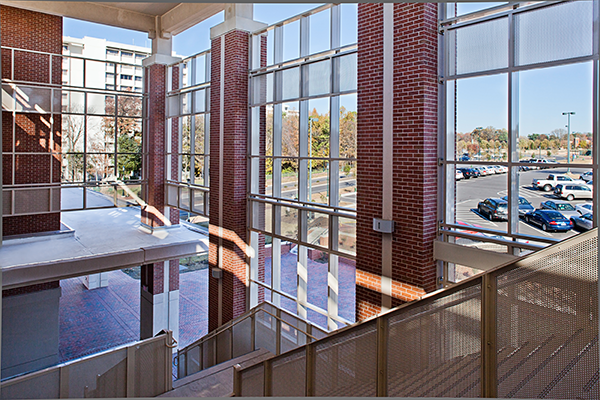 Photo taken from the inside staircase of South Village Deck. Drew Averitt, Facility Planner for Business Services explains, "Main Street Market will be totally new this fall, completing what began with our Subway project a while back." Use Your Noodle/Sushi with Gusto and Bojangles are coming out, Subway is staying and a Panda Express is going in! Au Bon Pain soups will continue to be served from an improved well station and an expanded grab-and-go counter will be added, too. But wait -- what about Bojangles'? Not to worry! No one would dare take Bojangle's famous chicken 'n biscuits and legendary iced tea away from UNCC! Instead, Mamma Leone's in the Student Union will go away and an expanded, full menu Bojangles' will take its place. So just in time for football season tailgating, we'll have bone-in chicken and all the other good things Bojangles' has to offer, right here on campus. 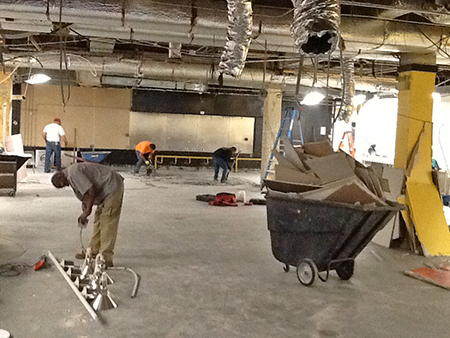 Fingers crossed, Panda and Bo should be ready in time for the start of fall semester.